Within EzzyBills, You can view, search or approve invoices from the “View” page. Login, click the link “Viewing/Approve invoices” at the bottom of the page. The “View” window will be display in a separate tab. How to Select an invoice in “View”? 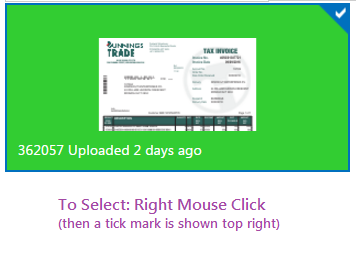 To select, mouse over the invoice tile, then right mouse click (A tick mark is shown on selected invoice tiles at the top right corner). What you can do within the “View”? It shows tiles of invoice icons. When mouse over it, it will show invoice data and clicks. Rarely, for some document coming through to us via emails and they have been classified as “non invoice”, you will see a button “Reclassify”. Click it, this document will be reclassified as an invoice and you can manually enter the data. 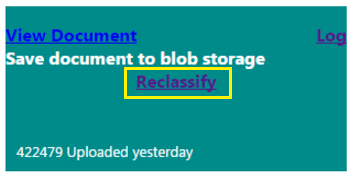 See more on “Reclassify”. you can search all your past invoices, just enter a search term such as the Supplier name or Invoice Total, anything that appears in the invoice description can be searched. Re-process: this is part of approval processes. It is used when the supplier is not identified correctly – you made changes in Xero/MYOB, then re-process before approval.